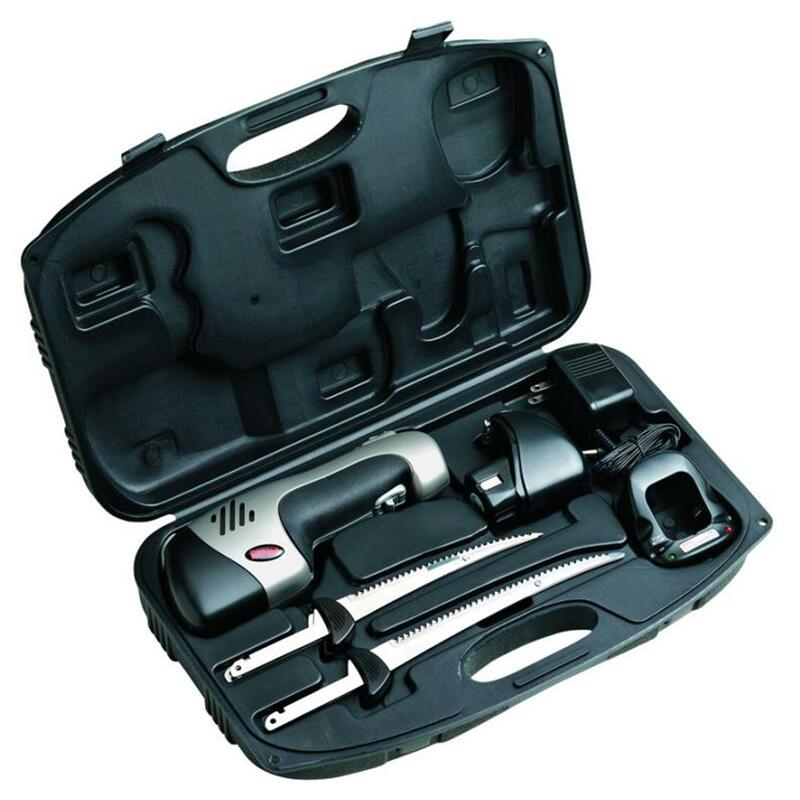 Make quick work of your catch using the Rapala® ProGuideTM Cordless Electric Fillet Knife Set. No cord means no tangles and no restrictions, just quick and easy go-anywhere fish cleaning. Quiet long-lasting motor will slice through your stringer of crappie, walleye, and perch with either a 6" or 7.5" set of reciprocating style blades. Two battery packs recharge in under 4 hours in the 12V charging base. Take and use anywhere with its included plastic storage case. Rapala ProGuide Cordless Electric Fillet Knife Set is rated 3.3 out of 5 by 14. Rated 4 out of 5 by Stag from Good quality Nice knife works great for all you on the go filleting . Great to have on the boat , on the open dock, or by the farm ponds. Just don’t like how the safety is on the trigger. Kinda get is the way and may cause blister after extend use. Batteries last longer than expected. Rated 2 out of 5 by Michael from I bought this and the first trip out cleaned 12 fish and the blade removing button broke, now I can't get the blades out. The trigger button has a safety deal that makes it very uncomfortable to operate, not happy at all with this knife. Rated 5 out of 5 by Donald from Cuts like butter Used it for the first time to filet some surf perch we caught. It was fantastic as it cut through the fish like butter. Very easy flipping the filet and cutting under the skin as well. Fantastic knife. Great having it cordless for the fish cleaning stations. Rated 1 out of 5 by never again from Worst knife Rapala ever made Always used Rapala and have been very happy with them till this design. Bought it and used it for first time. died after 3 fish and second battery would not work. Returned it thinking it was a defect. It was not. The replacement did same thing. Rated 4 out of 5 by Hungry Fisherman from Greatprice Best price I could find anywhere for the all inclusive set and carrying case. I wish the electric knife had a "lock" to keep blades moving while changing hand grips...the safety system enforces holding two button's down at same time to make it functional and that feature makes the knife hard to hold at different angles while keeping blades moving. Rated 1 out of 5 by Ron D from Rapala Pro Guide Cordless Electric Knife D Battery charger did not work!